The Z-Match is an extremely flexible aerial matching unit (AMU) originally dating back many years to the first designs for unswitched multiband valve power amplifier tank circuits. This particular variant is a dual version covering all amateur band from 1.8 - 146MHz with the correct value components but does include switches to overcome certain tuning capacitor limitations. Some years back the author built a dual Z-Match covering 1.8 - 146MHz in a Heath SB-101 series cabinet with the appropriate metering and switching for multiple transmitters and aerials. 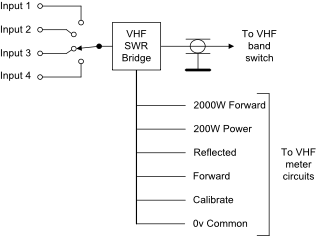 Separate SWR bridges are used for HF and VHF, both from Heathkit units. The meter and small knobs are also from a Heath SWR Bridge and the front panel has been painted and labelled to match other Heath SB-line units. During summer 2013 the original unit was re-engineered to be more robust and to add some extra functionality including a screened HF dummy load. See elsewhere on this site for painting and lettering information. The version 2 HF section circuit is shown below. 500pF maximum single section, variable capacitor held off the chassis with insulated mountings. An insulated shaft coupler must be used. 9t of 18swg, tapped every 3 and 6 turns with an ID about 0.4inch greater than L6. This inductor assembly must be fixed over the cold end of L6 with insulating spacers and a suitable adhesive. 250pF per section max value, double gang variable capacitor. 19t of 18swg with an ID of 1.6inch, turns spaced apart with 22swg wire which is subsequently removed. 6t 16swg 1.75inch ID, each turn spaced about 1/6" and mounted concentrically over the cold end of L2. 6t 18swg 1.25inch ID spaced apart to take a total of 1.25inch. 3t 18swg 18swg 1.75inch ID, each turns spaced 0.62inch apart. The frequency coverage is dependent on the maximum to minimum swing of C1, C2 and the respective inductor values. A three to one frequency coverage requires a nine to one capacitance swing plus some contingency so it is recommended that any preset trimmer capacitors present on C1 and C2 be removed and wiring capacitance be minimised. The impedance matching range is primarily dependent on the turns ratio of each pair of coils and the values of capacitors C1 and C2. If you have problems getting a good match then it may be necessary to adjust the turns ratio by increasing or decreasing the number of secondary turns. For example, if the Z-Match provides a minimum SWR reading with C1 fully meshed then the impedance being presented is probably very low and the respective secondary winding should be reduced by one or more turns and tuning retried. For transmitter powers up to around 25 watts "old fashioned" air-spaced broadcast tuning capacitors from valve radios will probably be fine - transistor radio plastic dielectric tuning capacitors may flash over or run warm at powers over 5W - best to experiment with a prototype first. There is a much higher chance of a flash-over when the impedance presented to the AMU is high and the transmitter power is high. The actual number of turns will depend on the tuning capacitor maximum and minimum values and your layout. It is best to prototype and test the coils before making the final versions. Each pair of coils for L1/L2, L3/L4 and L7/L8 should be supported using perspex or acrylic sheet and some form of low loss solvent based fixative e.g. polystyrene or acrylic cement. These supports can be attached to the chassis using long, tapped, insulated spacers. The relatively high number of turns on L6 will require a conventional low loss coil former - ceramic is fine but fibre-glass or white plastic kitchen waste pipe is also fine and is more easily available in a range of sizes. In order to allow for alternative tuning capacitor values, L6 could be made with a few taps to make for easier adjustment. Alternatively, constructors may wish to determine the number of turns required for the tuned winding L6 during a prototyping phase and then dispense with the taps. The entire unit should be built in a metal box of sufficient dimensions to allow a spacing of at least one coil diameter between each coil and the nearest side of the box. Slow motion drives make for easier adjustment and perspex dials calibrated 0-100 allow settings to be recorded for future ease of re-tuning. The constructor may wish to include an SWR Bridge, dummy load and selector switch inside the Z-Match in order to make a self contained unit. Click here to see photographs of the front and rear panels. Click here to see a photograph of the original version 1 internals. Click here to see a photograph of the revised version 2 internals. HF wire joins are either bound side by side or use 3/32 inch brass tubing for an inline joint and soldered - this eases the problems of later disassembly and maintenance. The revised schematic of the HF section is shown above. 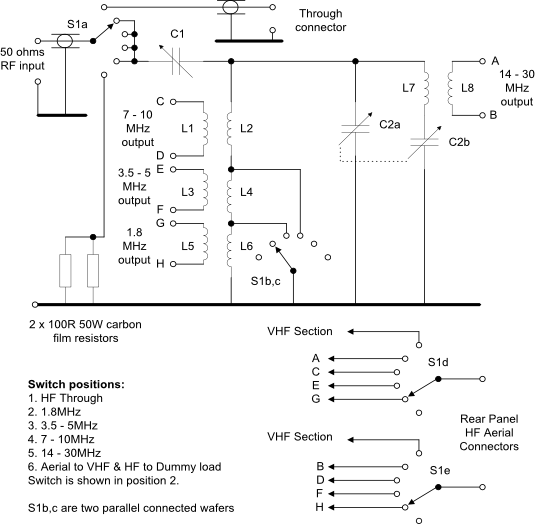 The VHF schematic is shown below. See the connection diagram below. Switch the SWR Bridge to the dummy load. Key up, tune and load the transmitter for maximum output if these controls exist (probably only on older valve rigs as modern solid state rigs are broad banded). Ensure that the VSWR reading is showing 1:1 or very close i.e. very low reflected power. Reduce the power output to around 10-25% of maximum so as not to strain the PA and de-key. You can achieve the same result by selecting AM if available on your rig. 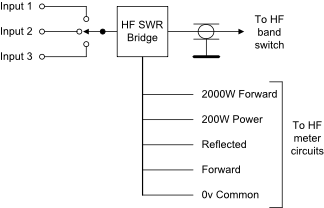 Switch the SWR Bridge to the Z-Match with an aerial connected. Find a signal on your chosen band. Select the frequency range required on the Z-Match and adjust both Z-Match tuning controls for strongest received signal strength. Now find a clear frequency, key up the transmitter and adjust both Z-Match tuning controls for minimum reflected power on the VSWR bridge i.e. SWR is 1:1 or very close. Increase the output power to the required level and you are now correctly matched for that band. Dekey the transmitter and note the settings for future use to reduce tune-up time. Trying to adjust a Z-Match by watching the PA current or RF output power does not guarantee that the match will be correct and may lead to damage to your PA device(s). The SWR bridge method is by far the best. 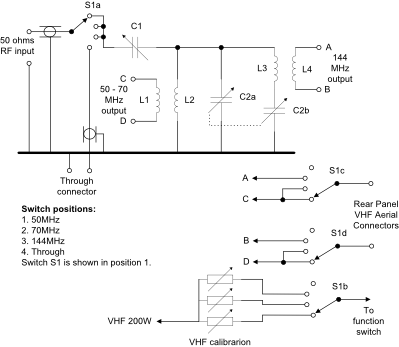 The VHF section shown right uses a very similar circuit to that of the HF unit although the component values are significantly less and no tuned circuit switching is required. C1 is a single section 3-15pF variable capacitor. C2 is 35 + 35pF. Note that the minimum value of C1 should be low to give the best range of imepedance matching so some form of selection may be required and the wiring should be a short as possible. L1 = 2t 1.2inches ID spaced 0.75 inches in total, L2 = 3t 1.0 inch ID spaced 1.0 inch overall. L1 positioned concentrically over L2. L4 = 2t 1.2inches ID spaced 0.75 inches in total, L3 = 3t 1.0 inch ID spaced 1.0 inch overall. L4 positioned concentrically over L3. All coils wound with 16swg enamelled copper wire. The layout of the VHF section is much more critical than the HF section so some adjustments may be required for each constructor’s own version. The metering circuits are shared between the HF and VHF sections. The VHF section includes calibration controls to correct small differences in the frequency response of the VHF SWR bridge across the 50 - 146MHz frequency range. Details are left to the individual constructor. Metering controls consist of a toggle switch for HF/VHF selection, a 3 pole 4 way switch for 200W/2000W/Forward/Reverse and a potentiometer for SWR sensitivity.